The GRIMM Corporation has taken control of all planetary activity. Defying their laws one lone R.E.D.D Agent uses her combat skills and high tech weaponry to fight Monsters, battle Grimm Soldiers, and save earth from destruction. It's the year 2233. America is no longer a super power, and Earth is no longer a central planet. Half of Earth's population has moved on to other planets in our solar system and beyond. As all the major cities have fallen to war or catastrophe, it is the rural areas where large communities have thrived. Magic Valley is one such place. The U.S. Military is dying. Slowly being taken over by the large Grimm Corporation which has all but seized power of the Alliance and all the Unified Planets. The last U.S. Military base is about to be closed for good, leaving communities like Magic Valley unguarded by terrorist factions. And unprotected by the growing evil in the forests of Magic Valley. A growing dark energy consumes the woods, spawning evil creatures, Werewolves, Vampires, and Zombies. This energy threatens to spread to the communities and eventually the destroy the entire planet. 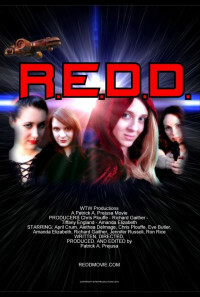 The last Secret U.S. Government Agency is a secret division of soldiers known as R.E.D.D. The last remaining "Ghost Agent" aka "Agent REDD" is the only person left to confront this evil. Defying the laws of the GRIMM Corporation one lone R.E.D.D Agent uses her combat skills and high tech weaponry to fight Monsters, battle Grimm Soldiers, and save earth from destruction. Regions are unavailable for this movie. Click the "Watch on Netflix" button to find out if R.E.D.D. is playing in your country.